Can the Lion Roar in The Craven? Bidding to become the first horse since Twice Over in 2008 to win the Craven having had two unbeaten runs as a two-year-old. Currently only rated 107 but Twice Over was only rated 94 at this stage of his career. Has also won at Newmarket. Peter Chapple-Hyam hasn't trained a winner of this race since 1995, but this one tries to emulate last year's winner Eminent having won his only previous race at Newmarket. Yet to be given an official rating so still falls into the could be anything category. Was ridden by Ryan Moore to his previous success but is now ridden by Jamie Spencer, who last rode the winner of the Craven Stakes in 2009. Won two of his six races so far but he's raced in Meydan already this season, and the last 10 winners were all making their seasonal debut. However, his rating of 112 makes him officially the second highest-rated contender. Yet to race at Newmarket. Tops the ratings on a mark of 118 and two of his three wins came here at Newmarket. Bidding to become another odds-on favourite, though is trained by John Gosden whose Foundation was beaten at odds-on in the 2016 renewal. Form of his second to Saxon Warrior in the Racing Post Trophy looks top-class. Raced three-times already this season and only rated 89 after five starts. Beaten just two of 27 rivals in his two races so far. No Hoper. Rated 99 after winning two of his three races, though not raced at Newmarket. Ryan Moore takes over in the saddle, though his record for Hugo Palmer isn't overly impressive. 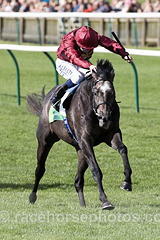 Roaring Lion complies with most of the prominent statistics of the past 10 winners, and the fact Foundation was an odds-on loser for John Gosden in 2016 is worth overlooking with the Gosden stable in excellent form. Glorious Journey could be the horse with the most improvement to come but he needs to find at least 12lb if he is to get his head in front.